powered MOUNTAIN sports in Australia. Your ace! Big hugs to the BC community for 2018 - Hopefully we’ll all be back for more, with more in 2019. Over’an’out! This Advisory is a comprehensive view of all the current observations of weather, snowpack conditions and access. SO YOU DON'T CHECK-OUT THERE! Weather, snow, ice and avalanche conditions are constantly changing and we are only able to provide small, static snapshots of this dynamic phenomena. This service will help you familiarise yourself with the observed conditions across three regions of the Australian Alps. Join the crew that keeps your stoke high and safety platform live. We need your support to provide the advisory service and to help protect (improve in some cases) our treasured terrain and freedom in the mountains. We are a booming bunch of like minded mountain enthusiasts, sign up today and pay it forward. Community is a small group people inhabiting a place with a similar particular characteristic in common. Our place is the mountains, our characteristics are varied. Here are a few things going on in the mountains (and towns) this winter. There are festivals, races and safety training for every level of participant. Everyone welcome. Over the course of the 2018 season we will be publishing a bunch of awesome guides to help you get the most out of the mountains. Compiled by local area experts, these will be available in printed and digital form. Routes, chutes and tour details. Free to 2017 members. We are crowdfunding ATCs. So you can double down on your avalanche multiple burial / recovery skills. It's a 'real time' treasure hunt. Because in a real avalanche, time is a killer. So here you can progress and hone your beacon smarts. Let's get real good at this, together. 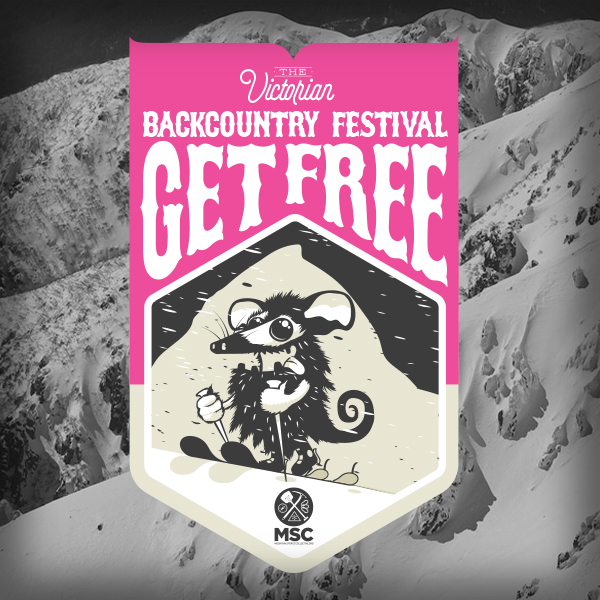 Wanna help fuel the stoke and safety of the MSC without becoming a member? Sure, we get it... 'Wear it forward' with some merch. Help us show the love for our patrollers, their dawn starts, deep pits and screaming barfies with plush hoodies, sweats and other suitable attire. Already a member? Use your discount code! This is a creepy scary little corner of the internet that catalogues conversations and first hand experiences with avalanches. Worthwhile reading, yet buried down here on account of it being a bit heavy and a buzz kill to say the least. Drop in here and let us know where your off to, with who... and when your expected to be back. This form is a verbatim copy of the Victorian Police form so it will port neatly into their emergency response process if needed. It's still the 'Nominated Contacts' responsibility to raise the alarm though. We will email your 'Nominated Contact', the police / ski patrol relevant to your destination. If your a interested in collaborating, sponsoring or just joining in an a supportive corporate capacity we'd love to hear from you. Orphaned by the government departments through 'too many unknowns / too rogue', and not exactly the 'rightside buttered pretzel 270' cool shiz. MSC is highly visible, passionate and dedicated. C'mon... Please help. This is a quick little interpretation page for those who are new to the reporting standards of this site. An important read for first timers. This website and its content is copyright of Mountain Sports Collective- © MountainSportsCollective.org , 2018 / 2019. All rights reserved. Any redistribution or reproduction of part or all of the contents in any form is prohibited other than the following: the explicit purpose of helping to communicate to the public about the particular alpine conditions / hazards that we are publishing alerts and warnings for. You may not, except with our express written permission, distribute or commercially exploit the content. Nor may you transmit it or store it in any other website or other form not made for the purpose of communicating alpine hazards specifically to Australian backcountry users.